Here's One From Last Night. My New 24mm F2.8 MC Rokkor-X (from KEH), mounted on a Sony Nex3. I really like the 24mm field of view, with film and digital. Looking at your samples I can't see anything wrong with the lens. I'll have to shoot a few test shots when it gets here..
a 102 w lens for 30 bucks. good going!! I modified the 58 1.4 to fit my EOS stuff about 3 years ago , works nice . Just picked up another XE7 for 50 buck. Some are sky-high (of course) but there is an amazing amount of stuff out there really on the cheap. Especially the older SRT-vintage. One of the best built SLR's of the 60's and 70's yet one of the cheapest to buy.. I'm looking a a 35mm F2.8 MC with original hood, and I don't want to go over $30. There are several offerings on the big site that could fit the bill. I saw one last night. Probably the one you are looking at.. I picked up this lens last summer with original hood and caps. An excellent portrait lens.. The 102 and 202 are my favorites with the SRT line.. I am also gunning for an XK body. I've always wanted one in good usuable shape. It's been highly recommended by a friend, who also recommended the XE-7 to me. The original XK accessories are something interesting and fun to collect. These cameras all have alot of utility left in them. Last edited by Nokton48 : 11-13-2011 at 09:05. I have the XK and yes they are fine cameras. I'm thinking of putting Griptac on my new 202, as I like to recover them. I think the 202 was the ultimate SRT, last of the lineage. Love the viewfinder in the 202. It's awesome. Last edited by Nokton48 : 11-13-2011 at 09:18. I've used this site http://www.rokkorfiles.com/conversion.htm for converting my SRT's to silver oxide. Before doing this conversion I check the prism meter blocks for yellowing glue. If they need repair I use this glue http://www.micro-tools.com/store/P-8...lear-Glue.aspx to re-glue the blocks after completely cleaning off the old glue. Then I do the conversion and re-calibrate of the meter..
That's cheaper than what I have paid at a local electronics wholeseller here. My first proper camera was an SRT 101 back in 72. Nice camera, but it was considered an enthuisiast camera. The Pro gear was the Nikon F, or the Leicaflex Sl. I decided to have a look at the Rokkor line. Bought an XD-11 with some standard lenses and started to think about the 58mm f/1.4. Just found a SRT-101 with that lens at a bargain, hoping for a usable lens and just taking pot luck on the camera. Turns out both the SRT-101 and the 58mm f/1.4 lens are in excellent shape, even has a good battery, operative meter, and all quite clean. The 58mm F1.4 MC Rokkor seems to be highly regarded on the Internet. Which is good, since I have a few of them. 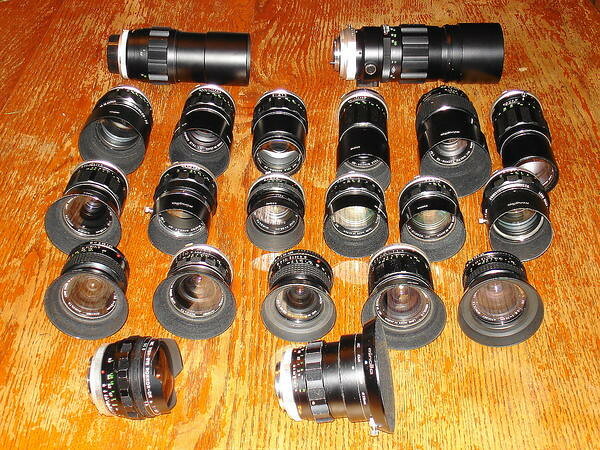 It's great when lenses "turn up" you didn't even realize you had. Must have come with bodies I acquired? Anyway, I will have to test the 58mm F1.4 against the 58mm F1.2, and the 55mm F1.7/1.9. Some prefer the 58mm F1.4 to the 50mm F1.4 MD Rokkor (which I don't have). New acquisition. 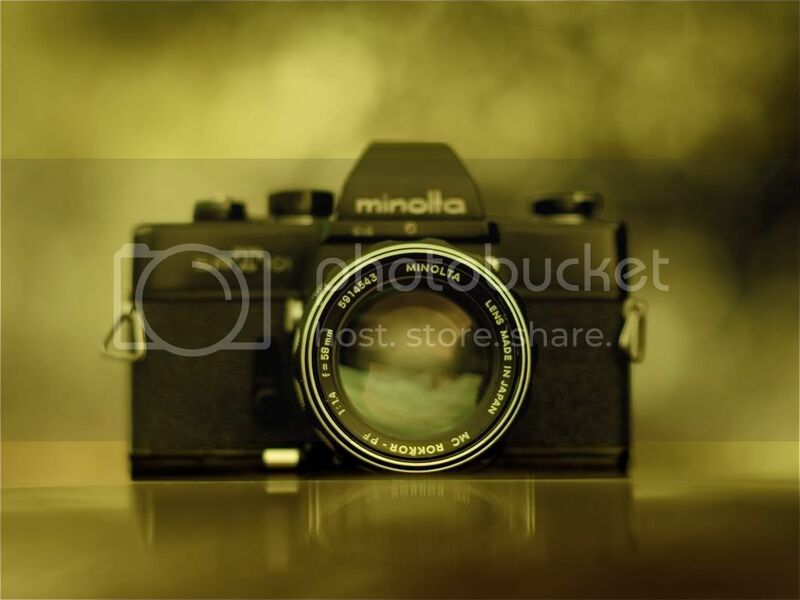 The Minolta Deluxe III Flashgun, which uses flashbulbs, and is the correct flashgun which matches the vintage of the SRT101. For some reason, Minolta Flashguns go for skyhigh prices on Ebay. I found this one, in perfect working condition, for $7 on another auction site. It should be here in a few days. Last edited by Nokton48 : 11-19-2011 at 12:36. The 58mm F1.4 MC Rokkor seems to be highly regarded on the Internet. I picked up two of them this week. I need to get the adapter so I can try them on my Olympus E-620..
My MC and MD Rokkor Lenses. These lenses are easy to clean internally. Just unscrew the front and back groups with a spanner, and clean the oily blades with electronic contact cleaner and q-tips. I've done that recently with the 85mm F1.7, the 35mm F2.8 MD, the 50mm F1.4 MD, and the 28mm F3.5 MC. Some are inexpensive, too. I just bought the 35mm F2.8 for Five Dollars! My recent goal was to get original Minolta lenshoods, original Minolta UV/Sky Filters, and lenscaps onto everything. I'm nearly there. You need to differentiate the PF (6 lenses) and PG (7 lenses) formulas. I can only recommend Antony's website to any SRT enthusiast. Yes, I too started photography on an second-hand SRT-303 25 years ago. Gave it away foolishly. Bought another. Will give it some love... some time. Nokton, congratulations on your outstanding collection. I used to have the 200/2.8, 17/4 and shift 35, as well as a battered XM (European market XK). I understand where you come from. "Time. Time. What is time? Swiss manufacture it. French hoard it. Italians squander it. Americans say it is money. Hindus say it does not exist. Do you know what I say? I say time is a crook. " - Peter Lorre as O'Hara in "Beat the Devil"
The 58mm f/1.4 is a PF. The PG's are the 50mm f/1.4 lens and 58mm f/1.2. Al are outstanding lens. Last edited by colyn : 12-15-2011 at 18:06.
congratulations on your outstanding collection. I understand where you come from. Thank you for that, Alec. I have come a 360 degree circle, and at one time was of the opinion that these are not professional grade tools. Now that I have come back to them, I find that I am quite comfortable with these old friends. And I appreciate them for what they are, and what they can do for me. Like many here I first started with Minolta on the high school yearbook staff and, when I graduated, I bought a 101 of my own. I am still shooting with it. I move away for awhile but I always seem to come back. Now I have a 201 that I enjoy using as well. I have been fortunate to pick up some pretty good Minolta and Vivitar glass over the years and both these cameras are responsible for some excellent images. I enjoy using rangefinders as well and know that Minolta had some nice ones. One of these days I wouldn't be surprised if I end up attracting a Minolta rangefinder to the flock. SRTs are not pro bodies because they arent system bodies. Minolta has good glass and good focus screens. BTW anyone know who I should talk to about getting a Rokkor lens overhauled? While I do agree that the srT's are not pro bodies they are of pro build quality..
Minolta I believe has top quality lens which out perform other brands.. Agreed they aren't system bodies, but many knowledgeable professionals know these can be used for pro work without issue. In the SRT era, the motorized SR-M was the pro model (have one of those in great condition, presently looking for the SR-M 250 exposure back, and a few more of the original accessories for it). And of course, in the late 70's, the XK was Minolta's answer to building the system SLR (also looking for one of these in good condition). To me, the XK looks exactly like an SRT that takes interchangable finders and screens, and I have the SR-M pro body for tough rugged motorized work, so I don't have much interest in the later very expensive motorized XK. In fact if I could have found a good motorized XK way back then, I might have never left Minolta, and gone on to original Canon F-1, Nikon F/F2, and so on and on. Rokkor glass is some of the best available, at any price. Any good repair shop should be able to fix a Rokkor lens, depending on what is specifically wrong with it. What's up with yours? Last edited by Nokton48 : 12-16-2011 at 22:36. The back half of the housing is loose on my 58/1.2 and I dont feel that poking around in there is such a great idea for me. It also has some haze/condensation on one of the elements, which I would like cleaned if that is possible in a non-destructive way to the coatings, which Im not sure of. I have the very first metal grip ring version of the lens, so I had assumed it has single coating and may not stand up to being cleaned. They do very good work, (not extremely cheap) but very quick and reliable. Other members may suggest other shops. OK Guys???? In some cases such as the 50mm f/1.4 the MC version is slightly better than the MD version. I have the complete lineup of MC lens except the mirror lens myself. Those mirror lens are currently out of my price range. I keep a few MD's around for the XD-11 when I need program mode..
Love the XE-7. The meter on mine is deadly accurate too. The R3 was based on the XE-7 while the R4 was based on the XD-11.. Both use the Leitz Copal shutter.. Thanks! For some reason KEH totally slipped my mind. That is a nice one. The 101 is my favorite. For me Minolta got it right at the start. True the SRT was refined over time, but I reach for my 101 first every time. And here's a Minolta XK Mot with alot of character. Cool that it is an old Newspaper camera. XK Mots tend to be very 'spensive. Good price! I once had one but sold it years ago. Wish I still had it..
101... photo taken with an MC ROKKOR PF 58/1.4 @ 1.4. It is cool, but it is a problem to. And this XK is a good sample (externally) of overused, probably abused camera. It looks like went to hell and back. One of the reasons I enjoy RFF so much is because of how it, with threads like this one, promps me toget out and use other cameras in my collection. In this case a SR7. Another innovative piece of history. These older cameras weren't as easy to use as the "AUTO EVERYTHING" of today. When I get it right with a manual camera, luck aside, I feel like I've accomplished something. When I do it with one of these old gems I do wonder however "Are the planets aligned, or have I improved a little bit?" Not one to carry a camera to impress(I don't even own a Leica) I do enjoy the curious looks the old ones bring as some try to discern just "what kind of camera is that and where's the screen?" Usually backed up with" Film? Can you still buy film? I am considering selling an SRT102. Just not enough room on my farm for all my stuff. It has taken me a few weeks to make this decision. My black 101 was at risk too, but I just have to keep that one. I wish I had spotted this thread when if first started. I have long wondered why Minoltas don't get more respect. My first camera (1971) was an SRT 101. That was my only camera until sometime in the late 80's when I saw a used XK in a store window and just had to have it. The XK continues to be my most loved camera, even after 4 years of investigating and buying rangefinders and other SLR systems. Its a fantastic camera, bright viewfinder, well placed meter readings in the viewfinder, and a very convenient exposure control adjustment while shooting in aperture priority.